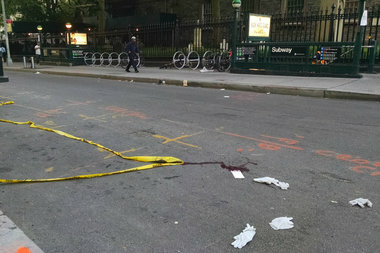 He was slashed near Broadway and Fulton Street, officials said. FINANCIAL DISTRICT — An on-duty World Trade Center security guard slashed the face of a man who placed a french fry on his head in a McDonald's early Monday morning, staff said. Saul Puente, 55, of The Bronx, was inside the fast-food eatery where he regularly eats at 160 Broadway, near Cortlandt Street, about 3:40 a.m. when a group of teens started antagonizing him, staff and police said. "There was a group of teens ordering. One of them got his fries and just put a fry on the security guard's head," said the restaurant's manager, Alan Garcia, 20. "It's ridiculous when you see someone act like that." "You got a problem?" the guard asked, according to the manager. "They were arguing. There was pushing," Garcia said. Some of the teens left, but the one with the fries, who police said is 20, stayed and continued arguing, the manager said. "I was trying to break it up, telling the kid to leave. When I tried to break it up, he threw his order of fries at the security guard," Garcia said. The argument spilled outside and up three blocks to Broadway and Fulton Street where the guard pulled out a knife and cut the other man's face, an NYPD spokesman said. "He was moving. There was blood. One guy was screaming in pain," said Nick Najiv, 47, a food cart vendor. "The cops came and stayed next to him. They called an ambulance," Najiv said. The victim was treated at Bellevue Hospital for injuries that weren't considered life-threatening, officials said. Police canvassed the area and arrested Puente, who works for AlliedBarton, at Church Street and Vesey Street, police said. He was treated for a cut to his mouth at Lower Manhattan Hospital, an NYPD spokesman said. "The security guard is a nice guy. He's a daily customer," Garcia said. An AlliedBarton spokeswoman said the company was conducting their own investigation and cooperating with authorities. Puente was charged with felony assault, an NYPD spokeswoman said, and was expected to be arraigned in Manhattan Criminal Court. The Port Authority, which oversees the World Trade Center site, did not immediately respond to a request for comment.